What do the cities of Appleton, Franklin, Glendale, Madison, Milwaukee, Wauwatosa, and Whitefish Bay share in common besides high property taxes? Ten energetic, competitive women passionate for the game of tennis! These women formed a team together for the first time this summer. Although they share a passion for the game, their backgrounds are quite diverse. While young at heart, they range in age from 50 through 65. This team has no plans for slowing down any time soon. “Over the Hill Hitters” may be an appropriate name for some teams at this stage in life, but not for these competitors. Don’t think they lack energy or competitiveness. Team “RUSH & CRUSH” says it all. The teams’ occupations are as diverse as their ages! Individual careers include a CPA, a sr. vice president of investments, a division 1 university women’s tennis team coach, a senior scientist, several certified tennis teaching professionals, a school teacher, a retired school teacher, and a retired businesswoman. Some of the team members competed against each other as members of various intercollegiate tennis teams in the 1970’s. Following college the ladies continue to compete against each other in sanctioned tournaments throughout Wisconsin. They are still capturing many tournament titles. This summer, many of the individual team members are competing in numerous National Championship Tournaments held throughout the United States. This level of competition affords the individual members the opportunity to compete against players within their respective age groups and also against former professional tour players. This year, the team boasts many individual 1st thru 5th place finishes. To attain this level of play, the women spend much of their free time on the court and also do extensive cross training. Staying “off of the couch and on the courts” seems to be their winning formula for staying healthy, young, and successful. The ladies look forward to many more years of national tournament competition because the national tournaments provide competition and national rankings (in 5 year age increments). Every half decade or decade birthday is a welcome event because it provides the competitor the opportunity to compete in a new age bracket. It also makes the competitor feel young again, because she is the new “youngster” in that age category! Competition in these tournaments is provided for competitors up thru the age of 90 . Check out the rankings and National Tournament results at www.usta.com. Team RUSH & CRUSH captured the WI state title this month and is preparing to embark on a road trip to Indianapolis August 23rd, to compete in the 2007 United States Tennis Association/Midwest Sectional Championships. Established in 1979, the USTA league program provides adults and seniors recreational competition with the opportunity to compete against players of similar ability levels. In the Midwest section, there are 57,000 competitors competing this year. Team Rush & Crush will be competing in the 4.5 senior division, representing the district of Wisconsin at Indianapolis. Competitors will represent Illinois, Indiana, Michigan, Ohio and parts of Kentucky and West Virginia. The team is spending many of its free hours on the court preparing for the tournament. Their goal is to have lots of fun in Indianapolis, compete strong, and advance to the National Championships October 19-21, 2007 in Indian Wells, California. 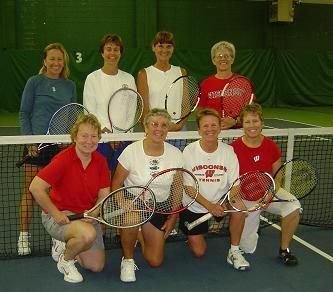 If this sounds like fun to you, try browsing the Wisconsin Tennis Association’s website at www.wisconsin.usta.com. Join a team and get involved. All ability levels are welcome and help is available to link you on to a team. Soon it could be your turn to be a champion!